Well, there goes my hopes for the filmmakers to keep out the fact that our heroes go back into the arena. This trailer basically tells the story leading up to the arena, but at least, unless future trailers spoil it, they're keeping the ins and outs of the workings of the arena out of the trailers. I already like the look of this film better than the first. It looks cleaner and more put together. Let's hope they are able to adapt this better than the first film. 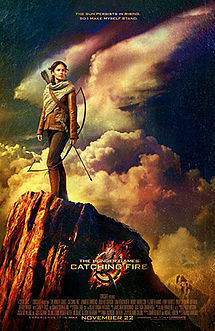 THE HUNGER GAMES: CATCHING FIRE will be released November 22, 2013, directed by Francis Lawrence, and starring Jennifer Lawrence, Liam Hemsworth, Josh Hutcherson, Woody Harrelson, Lenny Kravitz, Elizabeth Banks, Phillip Seymour Hoffman, and Donald Sutherland.